If you are looking for a lightweight, easy to use, and above all, non-lethal weapon to use for your personal defense and safety, there is no better option than ASP aluminum batons. These useful tools give you increased reach and striking power instantly, giving you an advantage over any threat when lethal force is not needed. Many other self-defense weapons can be as dangerous to the wielder as they are the attacker, and require extensive training to use effectively. Batons, however, are simple to learn and a great choice for any casual consumer looking for improved safety and confidence. The ASP Friction Loc Baton is the most tactically sophisticated impact weapon currently available to law enforcement personnel. Tested by the most elite federal teams, the Friction Loc has proven itself "virtually indestructible." This is the first choice of the world's most tactically advanced law enforcement agencies. You can rest easy knowing you will have the highest quality tool at your side, with advanced technology that is above and beyond the rest of the industry. The advantages this designer has over the competition are numerous. 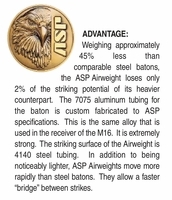 ASP aluminum batons are constructed from the same alloy used in the receivers of M16s, helping them retain their strength and durability while being much lighter. The result is that they are half the weight of heavier models, while providing nearly 100% of the very same striking power. Due to their lighter and easier to use design, they give you the ability to strike faster while being less fatigued, so you can handle your baton easily and make a quick escape from any crisis. We also have a great selection of ASP aluminum handcuffs that will help you disarm any threat in seconds. They have all the same powerful features of their heavier steel counterparts, while being 15% lighter. You can restrict the arms of any assailant and detain them with very little effort, allowing you to take control of a situation with very little training or effort. While they are lighter weight, ASP aluminum handcuffs are just as strong and rigid as steel, providing the same reliability and durability you need and expect of any self-defense tool. Take advantage of one of the best self-defense designers on the market with our collection of ASP products. We are proud to offer the best of the best so that you can rest easy knowing you are well prepared for any situation that comes your way. ASP Handcuff cases, most models have the snap loc belt loop that is also Molle compatible. ASP Handcuff Case Models with the adjustable Snap Loc Belt Loop are: 56131,56132,56139,56141,56146,56160,56161,56162,56169. Several models, however only have the leather belt loop, such as the 56133, 56163 and 56134. This list will be updates as more inventory rolls in.